Feb 14, 2019 Posted by AAfterwit on Feb 14, 2019 | Comments Off on Our Controversial Valentine’s Day Stance. Our Controversial Valentine’s Day Stance. EDITOR’S NOTE: Today is Valentine’s Day. Each year we trot out a post similar to this and each year, we get slammed for it. So be it. The worst holiday known to mankind is here: Valentine’s Day. But here’s the thing. Here is why we hate Valentine’s Day so much. Ladies and gentlemen, husbands and wives, boyfriends and girfriends, if you are only waiting for one day a year to tell your husband, wife, girlfriend, boyfriend, significant other, etc that you love them, you are doing it wrong. You shouldn’t show your love to someone just on February 14th. You should show it every day. You don’t have to wait to buy flowers for today. You should buy them whenever you realize how much that person means to you. You don’t have to buy a 5 pound box of chocolates to show that you love someone. Instead, go ahead and buy a candy bar and put it their lunch with a note professing your love for them. Do this throughout the year – not just on one day. Cards are the same thing. Don’t just give a card telling someone how much you love them on Valentine’s Day. Brighten up their day during the rest of the year by having a card come in the mail at home or the office. Hide a card in a briefcase, purse, a jacket, on a dresser…..you get the idea. Doing the little things all year are much better and more meaningful than doing a big thing once a year. Your love lasts all year, so why “celebrate” it on just one day of the year? If you aren’t telling your lover in thought and deed everyday that you love them, we submit you are not doing it as well as you could and should be. Our purpose in this commentary is not to dismiss Valentine’s Day per se, but to rather encourage people to make “Valentine’s Day” a daily thing – 365 days a year. If you want to make February 14th a more special, that’s great. Our point is that if you are only celebrating and showing your love for a significant other one day of the year, you should re-evaluate what you are doing. A good friend of ours lost her husband to cancer on February 13th of last year. He was the love of her life as she was to him. The last year has been difficult (the first year after the passing of a loved one always is) but there are times when it is more difficult for her. She looks at pictures and mementos of their shared life and wants just one more day – just another 24 hours to show him how much she loved him. She’ll never have that chance, but you do. That’s our message this Valentine’s Day. That is our hope. That people are inspired to do more throughout the year than on just one day. The love of your life deserves it. Well, finally there’s a place for those celebrating Valentine’s Day alone, and it’s called Hooters. The restaurant is offering salty patrons a pretty sweet deal—rip up a picture of your ex, and get 10 of their famous wings for free. Hooters suggests its single customers either burn, bury, shred, or throw darts at the pictures for maximum satisfaction. It’s obviously the perfect way to celebrate Singles’ Awareness Day. Also known by its acronym SAD (get it? ), the anti-love reaction to schmaltzy Valentine’s Day show-offs has finally found vindication. Hooters isn’t the only spot for roasting your ex this year. The El Paso Zoo in Texas is offering local singles the chance to expose their exes for the cockroaches they truly are. The zoo will name one of the maligned insects after your awful ex and then feed the symbolic bug to a meerkat on V-Day. Ah, love. Finally, if you aren’t aware, there is a bit of a Valentine candy crisis this year. Good luck giving candy conversation hearts this Valentine’s Day. The chalky, colorful candies previously made by Necco and emblazoned with messages like “Be Mine,” “Love” and “Call Me” aren’t feeling the love in 2019. In fact, popular brand Sweethearts will be missing from store shelves. But hold tight – the candies are expected to make a sweet return in 2020. Spangler Candy Company in Ohio – maker of Circus Peanuts and Dum Dum lollipops – purchased Necco Wafers and Sweethearts in 2018 after Necco went out of business and closed its factory. It had manufactured Sweethearts for more than 130 years. 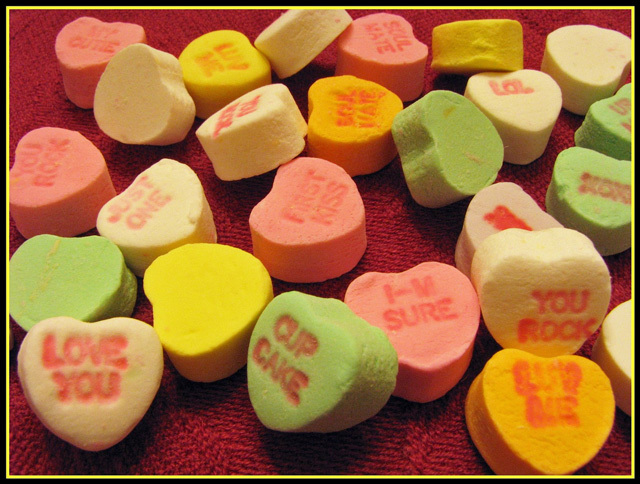 Brach’s Candy makes similar conversation hearts, but they aren’t the same as the original Spangler hearts. We will just have to try and survive the season without the iconic Spangler candies. Have a great Valentine’s Day and we hope the feelings you show today are demonstrated every day of the year.